Finally, I’ve taken a few snaps of the Springtime Bandit, a triangular scarf I made for my Mum for her birthday this year. The blocking came out perfect in my h.o. ; I hate when lace looks overly stretched and even though I would have liked to get a bit more out of this guy to make that 382 yards of Shi Bui Sock go a bit further, I didn’t want to overstretch and lose the light, airiness of the lace. Because that’s the whole point of lace! Fearing I did not have enough yardage (and I don’t think I did), I modified the lace border and created my own 10 row edge; it’s not nearly as beautiful as the original pattern, but it had to do as I didn’t want to search out one more skein of Shi Bui. Next time, I’ll work the entire lace edge chart, but I’ll have the appropriate yardage first. What’s more, I did six repeats of the body chart, rather than the four it called for, so there’s that to give it more oomph. I’m thinking I’ll need to reshoot the Springtime Bandit in the future; these snaps surely don’t do the colorway justice, but as always, more of them at its Flickr set. 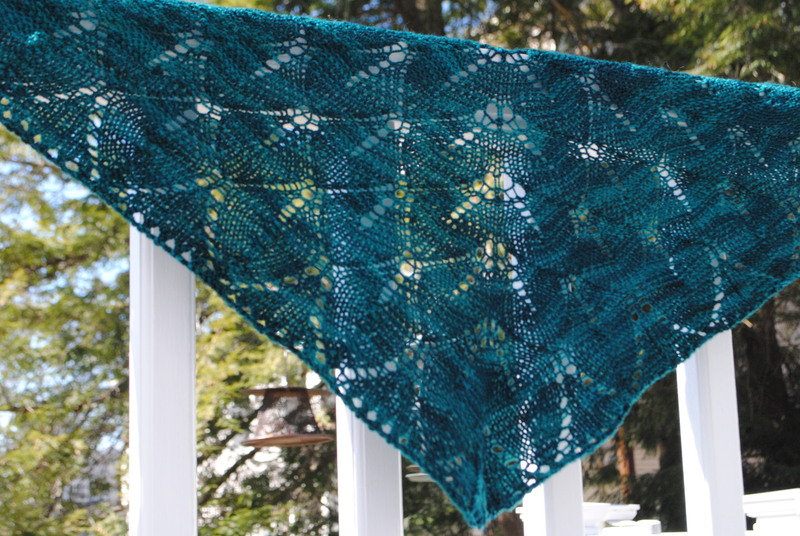 You can also get some notes on my project, mods I made, and all that hoo at its Ravelry page. The one upside to the snaps? The day I took to my mum’s back deck to snap away, the sun was beaming and the wind was lightly swaying…taking the lace away with it at certain moments. File Under: A pretty excellent representation of the “Springtime Bandit” if you ask me….